There are many tools in the market to design, develop, and test API’s. Some of these tools could be used separately. Some others could be combined. Every time a change is introduced in the design or implementation of an API, it would be nice to have tests and builds run automatically. Continuous Integration (CI) is a software development practice that allows builds and tests to be triggered every time new code is pushed to the repository. There are may tools that could be used to build this CI pipeline. This blog will share the experience of building a CI pipeline using Apiary (bought by Oracle in January 2017) for API Design and Wercker (bought by Oracle in April 2017) to help achieve this CI goal. Apiary (apiary.io) improves API development by promoting a documentation first approach. It is a platform for designing HTTP based web APIs. It starts with API documentation, then Apiary creates mock services and tests. 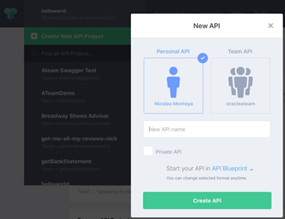 Apiary support two formats for API description: API Blueprint and Swagger. In Apiary, from the API dropdown select “Create New API Project” and the “New API” screen will popup. Find below an example of an API Blueprint description as displayed in the Apiary Editor. The FORMAT keyword shows this API description document is API Blueprint. The name following the first level heading “#” is the API name. The “hola” resource follows the second level sub-heading “##”. The “/hola” URI is inside of the square brackets. The “hola” action follows the third level sub-heading “###”. The “GET” HTTP method is inside of the square brackets. It returns a 200 status code and a JSON. Read the complete article here.